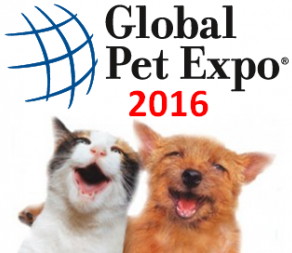 GLOBAL PET EXPO 2016 – “The Greatest Show on Earth” is coming soon! In 2015, Trade Show Executive Magazine officially named the 2014 Global Pet Expo as “The Greatest Show on Earth”, beating out a host of other events across an extraordinarily wide range of industries. When I consider this great honor in context of reviewing the 2016 exhibitor and show information , I can’t help but be struck by how far the Pet Industry has come from my first APPMA show in June of 1989 in New Orleans. The change really is just a reflection of the spectacular and still growing love affair that Americans have with our companion animals. Want some statistical proof? According to the government’s annual Consumer Expenditure survey, the Pet Industry has grown from $16.8B in 1994 to $64.3B in 2014…with over $41B spent on pets, food and supplies. In terms of Pet Food & Supplies expenditures, Americans exceed the household spending average for 50 consecutive years – from age 25 to 75. Even when the average income is halved after reaching age 75, pet spending keeps pace. With U.S. consumers demonstrating a lifetime commitment to our pets, is it any wonder that the industry and its showcase event, Global Pet Expo, continue to grow? But 10 x 10 is still the most popular size – with 405, in fact 70% of the booths are 20 x 10 or less. *By the same token, over 350 SuperZoo 2015 exhibitors weren’t at GPE 2015. Obviously, attending both of these shows is a “must do” if you want to keep up with what’s happening in the U.S. Pet Industry! There are five Specially Designated “Floor Sections” at GPE. Let’s start with a brief review. Natural – 122 Booths. This section remains strong after it was increased by 50% last year. Without a doubt, “Natural” has become a “magic” word to the “ultimate” buyers – the consumers. Boutique – 51 Booths. A “specialty” section which is considerably smaller than SuperZoo’s Rodeo Drive. One factor in the difference is the higher percentage of Retail Pet Stores among SZ attendees. Aquatic – 51 Booths. Up slightly from last year. GPE remains the “go to” show for aquatics. International – 51 Booths. This is somewhat “deceptive”. Last year GPE had 202 international exhibitors…one of every five booths. Expect a similar count in 2015. GPE is truly GLOBAL! 1st Time Exhibitors – 142 Booths. If you want to get established in the U.S. Pet Industry, you “must” do GPE. Every year, a major focus of GPE is “new”…both in products and in exhibitors. A word of caution: These are specially targeted sections but as we saw in the “international” example, there are large numbers of Exhibitors in the “regular” floor space with products that would qualify for inclusion in these sections. You need to “work” the whole show to insure that you get a good view of what’s available in the product categories of particular interest to you. In 2015 I developed a search tool for GPE and SuperZoo to make this type of planning easier. Show attendees could plan out their floor time by targeting the exhibitors with products that they were interested in seeing. Up to 5 product category searches could be run concurrently and the results were available in alpha or booth# order. This year’s tool will be made available shortly as the last few GPE 2016 booth assignments are finalized. Let’s look at the results from the research done in developing the 2016 GPE SuperSearch Tool. Cats are certainly Royalty …but Dogs Rule! However, cats are gaining ground. 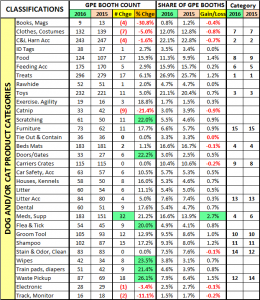 The number of booths offering cat products showed a significant increase and is now at 50%. This is up from 40% just 2 years ago. While booths offering products for Reptiles, Small Animals and Horses increased slightly in numbers, the percentage increase was significant. It demonstrates that these companion animals remain a strong part of the U.S. Pet Industry. Fish and Bird product exhibitors basically maintained their “share” of the growing GPE exhibitor count. The big gain is in exhibitors offering business services. This can “cover a lot of ground” – from Private Label Food manufacturers to POS systems. This increase further enhances GPE’s appeal! Dogs and Cats are certainly the royalty of Pet. Because of their huge impact on the industry, I have divided the products designed for them into 32 subcategories. Here are the top ten in exhibitor count for 2016. The big movement is in the OTC Meds, Supplements and therapeutic products. This is a trend that has been accelerating. One factor in this growth may be the exceptional inflation in Veterinary prices. Exhibitors with Food or treats are also growing in numbers. This is indicative of the competitive environment in these categories which is undoubtedly contributing to the ongoing price deflation in this Industry Segment. Also, many new Supplements are appearing in the form of treats. Grooming Tools, both for providers and consumers entered the top 10 in 2015 and continues to grow. 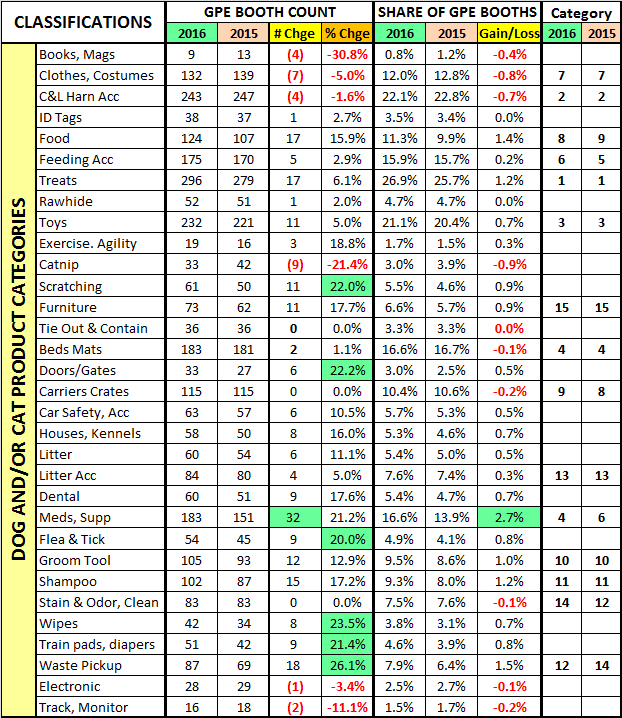 Finally, the chart below details the specifics for all 32 of the Dog/Cat product categories that I defined. Of note: All the data inputs for this report and the SuperSearch tool were derived from reviewing the GPE online exhibitor product listings AND visits to over 1000 websites. They’re not 100% accurate, but pretty close. Changes of special note from 2015 are highlighted. Which categories are of interest to your business? In addition to being bigger, the show staff actively works to make each GPE better, including enhanced educational offerings and of course…the New Product Showcase. In combination with the excellent work being done on SuperZoo, we have 2 “must attend” U.S. Pet Industry Shows. Thank you, APPA, PIDA and WPA! Regardless of why you are attending the GPE, having a productive show requires planning. It has simply gotten too big and is definitely too important to just “wing it”. The “GPE Super Search” tool that I referenced will be available shortly for download. Take a look. It can’t hurt…and it just might help.